Ted is A registered architect with 25 years of experience leading planning efforts for local governments. Ted also has experience facilitating public engagement and input processes, both as a professional consultant as well as through his many years as a community volunteer leader. As a sustainability consultant, Ted has an expertise in delivering thoughtful and comprehensive Climate Change, carbon reduction, and sustainability assessments, action planning, and consulting to businesses and communities; carbon life-cycle assessments and inventories for business, buildings, and communities; carbon offset consulting and sourcing for businesses and individuals. As a Registered Architect, Ted provides Net Zero architectural consulting, including solar PV site, financial, and feasibility assessments as well as building and site optimization and conceptual solar PV design. As an educator, Colleen has twenty-six years of experience with an expertise in curriculum design and differentiation. Colleen is accomplished in youth educational programming and Design Thinking initiatives. She leads paleBLUEdot’s community education efforts including community education seminars, workshops, and Design Thinking events for youth and adults. Her work supports the developent of educational materials and services, including workshop and presentation development, in support of educating communities. With a Master’s in Urban Planning and Regional Climate Action, Zoe has significant expertise in greenhouse gas accounting, corporate and governmental environmental sustainability reporting, regional economic development, and social services. Zoe leads paleBLUEdot’s Climate Action research and sustainable planning methodologies. Neil provides unique strategic guidance as one of the few consultants in the energy industry that has worked for both a major renewable energy developer and a major utility. He leads paleBLUEdot’s Community/Utility stakeholder engagement creating “win-win” strategies benefiting both community emission goals and utility goals and grid needs. Paul is a registered architect, a licensed professional engineer (mechanical), and a Certified Energy Manager with over 35 years of experience. Paul’s practice focuses on energy efficiency, energy management, and renewable energy development. As an Architect Paul as provided leadership on many LEED projects including design, coordination and installation of solar PV arrays, including a 75kw system on Princeton University Chemistry Building. As an independent engineer, Paul has provided system verification for several Net Zero Buildings including North Shore Community College and Salem State University solar thermal. In addition, he has personally installed many residential systems. 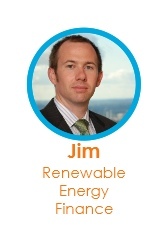 Jim obtained an MBA from the Johnson Graduate School of Management at Cornell in order to facilitate a transition into the burgeoning cleantech sector. He developed a deep subject matter expertise in regulated and deregulated retail energy markets as a leader in EnerNOC's world class SupplySmart practice. Today, he provides expert consulting, data products, and analysis related to retail electricity, natural gas, and water rates and tariffs. Jim’s practice is a specialized focused on end user utility costs. He produces high quality Distributed Energy Resource (DER) project financial evaluations with proprietary databases of utility tariff information, expertise in rate design, and familiarity with a broad range of clean and conventional energy technologies. Jim has experience working on projects in nearly every state and has represented or advised advanced energy companies in utility commission proceedings related to rates. Jim is familiar with restructured and vertically integrated utility market mechanics which allows him to provide robust and credible financial projections and scenario analyses for DER projects. With a background in the solar PV industry, Kara is experienced in coordinating the installation of residential and small commercial PV systems and supporting customers from the beginning of the sale throughout the full permitting and installation process. Kara also supported solar market transformation work at the National Renewable Energy Laboratory in Colorado. Her recent experience includes acting as a Community Solar Consultant facilitating training, outreach, and engagement for community leaders to work with city leaders in 7 county metro area to include clean energy goals in comprehensive plans. She currently providing administrative support for Community solar project subscription customers. In addition she has worked as a Solar Consultant providing research and data analysis; fostered relationship with Utility partners; Lead point of contact for all incoming community solar customer inquiries, including answering questions on available financial incentives for solar, and qualifying viable sites. Marc has 30 years as a green building consultant. His experience includes supporting the integrated San Francisco Bay Area green building market transformation, program manager for the renowned Austin Energy Green Building Program, and the Green Homes Northeast Program in Boston. Marc contributes to paleBLUEdot’s green building program services. Julie’s professional career has encompassed innovative work in both the public and private sectors. Her strength is in creating environments that encourage open dialog, new ideas, close collaboration and the delivery of superior services to critical audiences. From 1998 to 2012, Julie was the Assistant Director of The Wheeler Center, a non-partisan, privately funded public policy center dedicated to gathering Montana’s opinion leaders and citizens together to discuss and take action on critical state issues. There she lead over 25 state-wide community engagement program/issue creation, conference design, speaker procurement, marketing and follow up.